Makronisos Holiday Village offers guests both an exceptional location and facilities for a relaxing holiday in the sun. 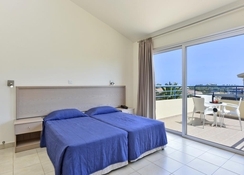 After your journey from the nearest airport, Larnaca International, just under an hour away, you’ll be able to start enjoying your holiday beginning with your luxurious fully-furnished and uplifting room. 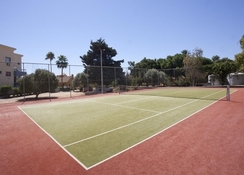 Head down to ground level and find something to entertain each member of your family, from a cabaret show to the tennis court, the Kid’s Club to massage, there’s something for everyone at Makronisos Holiday Village. Dine at one of three exceptional restaurants serving local and international cuisine or head out into the town to find more exotic options with many enabling visitors to dine in style as they look out over the Mediterranean Sea. Makronisos Holiday Village can be found in a relatively quiet spot in Ayia Napa otherwise known for its nighttime party scene. 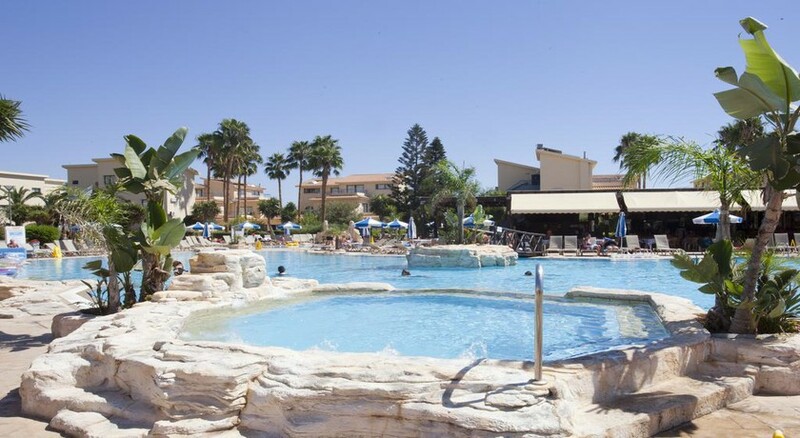 The nearest airport, Larnaca International Airport is just 60km from the complex. You’ll find the nearest beach just 1.5km from the hotel meaning a short walk will have you relaxing on fine sands under the glorious Cypriot sun in little time. There are a wealth of bars, tavernas and restaurants all within a couple of minutes walk. Great family fun can be had at the Water World Waterpark, less than two kilometres away. 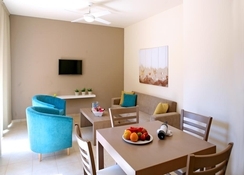 Makronisos Holiday Village provides guests with rooms that are bright and airy. They are well appointed and furnished and designed with delicate light tones. Guests will find several room types available from, which include, studio suites, apartments and bungalows as well as disabled friendly rooms also available. All rooms come with the essentials for a comfortable and relaxing stay such as air-conditioning, telephone, T.V., the private bathroom being just some of the basic amenities. All room types feature a kitchenette that is equipped with kitchenware such as a fridge, cooking hobs, toaster, microwave and much more. Apartments typically feature a larger living area and bungalows additionally include a patio, upstairs sun terrace and 6 double bedded rooms, ideal for a large family or a group of friends staying together. Makronisos Holiday Village is a great place for children and adults alike to stay entertained. Children will love the dedicated kids’ pool and play areas, mini disco and supervised Kid’s Club to name but a few of the ways Makronisos Holiday Village strives to take care of your little ones. ‘Big kids’ can choose from entertainment experiences including bingo, karaoke and cabaret show. Alternatively, you may want to take a dip in the freshwater swimming pool, rent a bicycle and explore Ayia Napa or take a relaxing massage. Out in Ayia Napa, you’ll find several beautiful beaches all within a mile of your accommodation. If you want to get wet and wild then most of Ayia Napa’s beaches offer a variety of water sports such as water skiing, kayaking and paddle boarding. Guests who have come to embrace Ayia Napa’s famed nightlife might want to head to The Square, Ayia Napa’s hub for partying through the night.